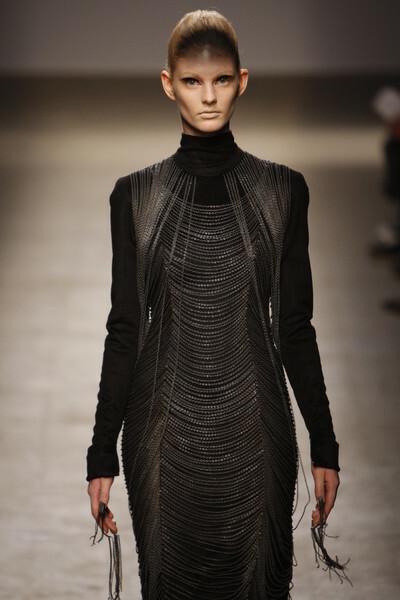 Gareth Pugh may have used a softer approach for his fall/winter collection, his models – with black sprayed foreheads – looked as Gothic as they ever did. They wore heavy, stiff, leather designs and some transparent pieces. Many clothes were pointy to the sides and a lot of the fabrics had frayed ends. 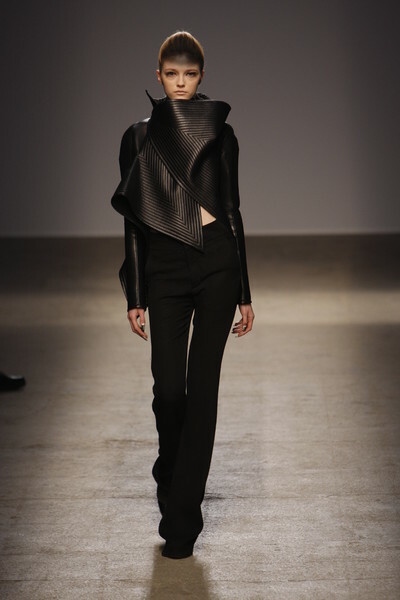 Strong were the women on the runway, dressed in Pugh’s long silhouette accentuating pieces. 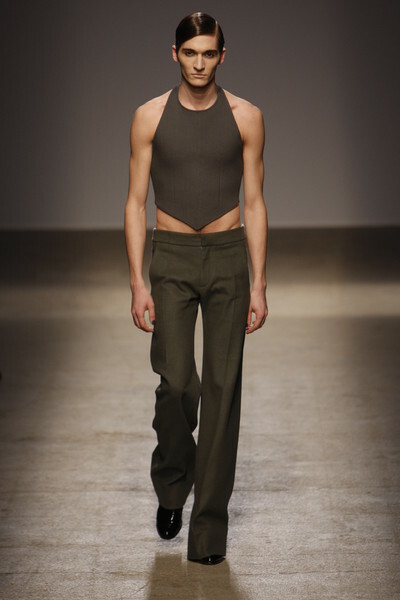 They looked quite the opposite of some of the male models, who were dressed in tight pants and a rigging or a tank top. Many of the clothes touched the floor as the models walked the runway. Especially the wide legged male pants were floor-sweeping. A lot of attention went out to the collars of the designs. They came in many variations (pointed, standing, folded) and looked out of the ordinary. The show pieces in Pugh’s finale must have weighed a few pounds extra while they had lots of gray chains attached to them. We didn’t immediately jump off our seats when we saw those, but they sure fit perfectly with the Gothic feeling of the show.